Screen Saver Override is a tool that gives you a flexible screen saver environment. Setting the computer's screen saver time to too short an interval will cause the screen saver to become a constant nuisance.Screen Saver Override enables the user to adjust the screen saver time to a better interval when the computer is being used. Upon starting Screen Saver Override, the screen saver will not activate before a user designated time. This time should be set to a greater period than the time the screen saver is set to in the control panel. If the computer mouse is moved before the Screen Saver Override time is completed, the Screen Saver Override time is reset to start again. 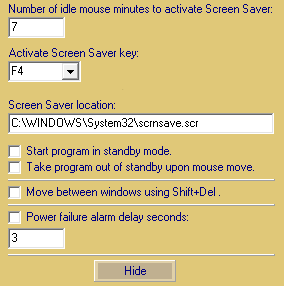 Thus, if the Screen Saver Override program is running and it's screen saver activation time is set to seven minutes, the screen saver will activate only after seven minutes of mouse inactivity. This way the screen saver will at least activate should the user become involved in other business and forget to set the Screen Saver Override program to standby mode, or quit the program. Single click the program's tray icon will set the Screen Saver Override program into standby. An Fn key can be selected from a drop down box that will turn the screen saver ON. There is an option to leave the program in the standby mode if the screen saver is automatically turned on by Screen Saver Override, or if an Fn key is used to activate the screen saver. Right click the tray icon to set the program to standby and to set preferences. Right click the tray icon to set the program to switch between windows using the Shift+Del keys (WinLoop). This feature may cause other key combinations to give bad results. It was created to help easily shift between programs while driving. Right click the tray icon to set the program to lock the screen saver off (Lock out). Click again on this new icon or click on the tray icon to disable the screen saver off 'Lock out'. Right click the tray icon and check the 'Transparency' menu item to set the program to use a mask to dim the screen rather than execute the screen saver. This feature was implemented so that a used can use the transparency mask to dim the screen when operating a computer in a vehicle at night. Click the 'Adjust' button to choose a color and use the slide bar to adjust the transparency. To remove the mask, click anywhere on it or press the Enter, Esc, or Space bar.